Is the gyspy in you looking for some fun, quirky clothing? Zingara an online store based out of Gurgaon, embodies a fusion of ethnic and contemporary fashion. Avantika Khullar, founder of Zingara, had studied jewellery design and worked as a teacher for 16 years. Her experimentation with fashion led her to launch her bohemian brand in 2015 and it quickly became a hit in Gurgaon and the rest of NCR. Her collection consists of clutches, bags, scarves, slippers, and jewellery. Bright and vibrant, her multi-functional capes and kaftans can be worn for both resort wear as well as festive Indian wear. 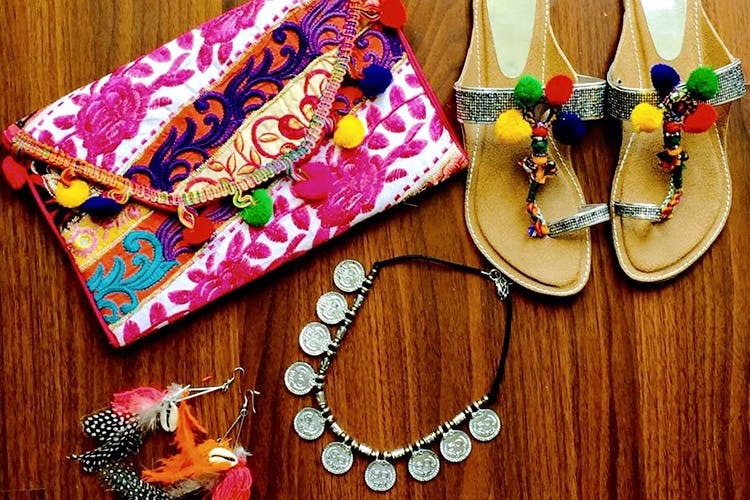 We love her statement banjara clutches, which amp up a minimal outfit. Her funky footwear and earrings embody the spirit of summer and are priced very moderately. The shoes are priced at INR 1,000 and her clothing ranges between INR 1,000 and INR 3,500, which is a pretty sweet deal if you ask us. You can check out her collection on Facebook. If you’re prepping for that trip to Goa or looking for a show-stopping outfit for your cousin’s mehndi ceremony, try going for the boho vibe with Zingara. Happy Shopping!